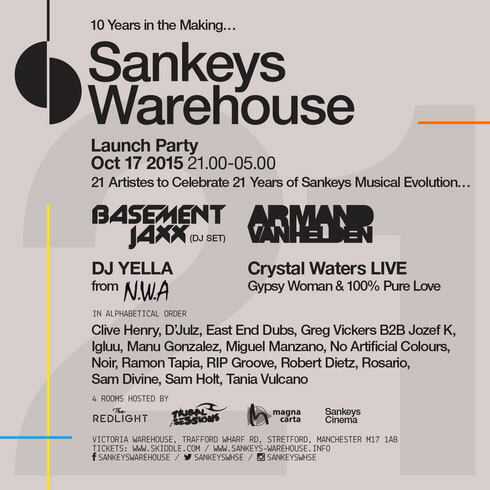 It’s been 10 years since David Vincent produced a Warehouse party in Manchester and this launch party on Saturday 17 October signifies 21 years of Sankeys musical evolution featuring classics and future classics from the last 21 years. Now, with new additions announced to the line-up, it has 21 artists playing at the launch party. DJ Yella will be joining the line up from the film “Straight Out of Compton” on his seminal gangsta rap band NWA. He will perform an exclusive strictly hip hop DJ Set and will be the very first DJ to open up the proceedings for the Sankeys Warehouse concept. Crystal Waters will be taking over The Redlight Room performing her 1990’s hit ‘Gypsy Woman’ live. Her 1994 track ‘100% Pure Love’ was released the same year Sankeys begun. Joining the Tribal Sessions Room is Tania Vulcano of Circo Loco and DC10 fame, who also first played at Sankeys back in 2004. RIP Groove joins the Redlight Room, the DJ responsible for the massive track ‘Double 99’, one of the founding tracks of the early speed garage sound. Sankeys New York boy and Serkal label boss owner Dave Rosario aka Rosario also returns to Manchester and finally, Miguel Manzano, one of the original Soap Bar residents from 2001, completes the lineup. David Vincent: “I’m really happy that the finishing touches of this line up have been completed. It’s all come together the way I always dreamed about for the past 10 years. I truly believe that this launch party lays the foundations of our Sankeys Warehouse concept and for our future events. In order to create these future events we need to first examine the 21 year musical history of Sankeys, whilst providing an education to the new generation of fans to what our institution has contributed to dance music over the past two decades.